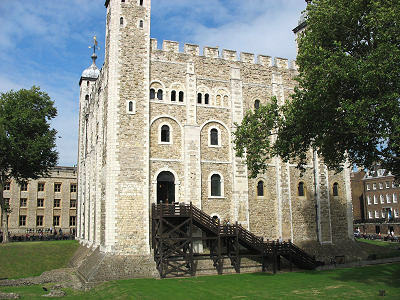 The tallest and largest building in the center of the grounds is called The White Tower. There are several floors with different exhibits, including weapons, suits of armor, torture devices and more. This building had many uses, including housing kings and their families, an armory, a chapel, etc. One of the more interesting things to see is one of the buildings which housed many prisoners over the years. On the walls are poems and short manifestos the prisoners carved into the walls during their incarceration. Some of these are literally hundreds of years old. We spent probably three hours at the Tower of London. There’s lots to see and learn, and you can purchase some interesting souvenirs. We exited the Tower of London and found ourselves in an ideal location to access the Tower Bridge. We had planned to tour the Tower Bridge and the exit for the Tower of London is within 100 yards of the bridge. So we walked to the bridge and entered the ticket office. Tickets were £5.50, and unfortunately we didn’t realize that we had a 20% discount from the Smartsave brochure. Be sure to get one if you are visiting the Tower Bridge. Your ticket allows you to walk the 239 steps up to the top of the Tower Bridge or you can simply take the lift as we did. When you get to the top, you will be able to watch a movie which gives some history of the bridge. Then you can walk out across one of the walkways that crosses the river. That’s a great place to view the city and snap some good pictures. From there you go to another room where another movie gives additional history of London and the bridge. 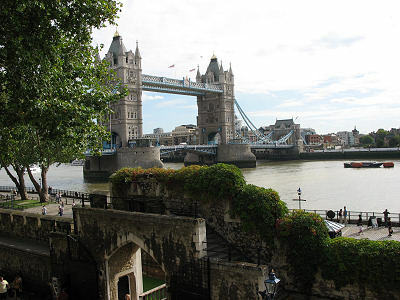 You can then go to the other walkway (there are two separate walkways over the bridge) and see more views of London. When you’re ready to leave you take the lift down, and follow a blue line outside and down underneath the bridge. You’ll reach a doorway where you present your ticket to another person and then go into the room that houses the hydraulic lifts for the bridge. Here you can learn about the mechanism used to raise the bridge. 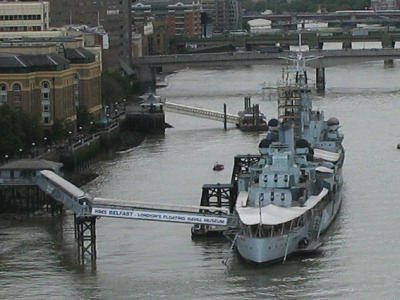 As we left the Tower Bridge tour we realized that the HMS Belfast was just down the pier, directly across the river from the Tower of London. We weren’t sure if it was too late to tour the battleship, because it was getting late. But we wanted to do it today if possible, since we probably would not get to this side of town again. We asked how long the tour would take and realized that we had just enough time to get through it. We purchased tickets for the tour and got 20% off thanks to the Smartsave discount. Tickets were regularly £8.50, so the discounted price was £6.80. It was not crowded on board so we were able to leisurely browse through the ship. They have very good directional signs which take you through different sections of the ship. We spent just over one hour on the ship. There is a great deal to see and if you are fascinated by naval ships the Belfast will satisfy your interest. After leaving the Belfast he walked back across Tower Bridge then went several hundred yards to the tour bus pickup. We waited about 15 minutes, along with several other people, then finally got on board the bus when it arrived. We rode the bus back toward our hotel and got off near the Charing Cross tube station, at Embankment Pier. We walked up and over the bridge/walkway and found ourselves on Villiers Street, which is crowded with pedestrians and some restaurants. We were both hungry so we decided to get some food. 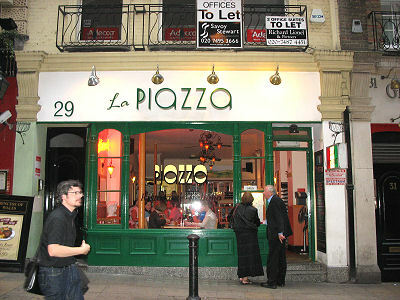 There was a small Italian restaurant called La Piazza which had very good food but less than friendly service. Our French waitress seemed to have an attitude, not just with us but with everyone else she waited on. I got a pizza, which was excellent. Susan had a cannoli. Total cost for the meal was £25.35, which included service (tip). One thing to be aware of is the way that taxes and tip are handled here. The VAT, which is the 17.5% Value Added Tax (I was constantly waiting for the added value to be brought to my table) is normally included in the price of whatever you are buying, unless clearly marked “plus VAT.” So unlike the US, where sales taxes are added on top of the price, the price you are paying includes the tax. This partially explains why prices are so high here. Tip: If you are visiting from another country, it is possible to get a partial refund of the VAT. This will usually only apply if you spend a minimum of £50 in a store. Ask for a VAT form, and make sure you fill it out and have it validated while you are still in the store. At the airport, present your forms, receipts and passport to Customs for certification. You’ll then be able to get a refund, less a service charge, from an agency in the airport. Check the HM Revenue & Customs website for more details. Getting a refund will probably only be worth the trouble if you make some large purchases. Tips are often included on the bill, and listed as “Service.” Be aware of whether or not this appears on your bill. The credit card slip that you sign may have service already calculated and printed on there, plus there will be a separate tip line for you to fill in. If you aren’t paying attention, you might end up paying a double tip if your bill already has the tip included. Another difference regarding the handling of paying the bill is the little credit card machines that your waiter or waitress may bring to the table. Instead of taking your credit card away and bringing the bill back for you to write in the tip and sign privately, they will bring this little credit card machine to your table, hand you the bill and wait for you to write the tip down. Then they process the card right there. I didn’t like this. While this may prevent stolen credit card numbers, it made me uncomfortable. In the US, we are left alone while we decide how much to tip, without the wait person standing over us. As we were sitting in the restaurant, through the front window we noticed people passing out free newspapers. They post a headline on a sandwich board on the ground so people can see what the main story is. Today the main story was that Steve Irwin, the Crocodile Hunter, had been killed. I didn’t realize he was popular here in the UK. We got one of the free papers when we left the restaurant then headed home to our hotel which was only a couple blocks away. I wrote this journal entry while watching Saving Private Ryan on TV. I finally turned out the light around 1:30 a.m. Susan was asleep long before that. I didn’t fall asleep for a while, and didn’t sleep well.